The big news is that Dr. Markus Covert and his lab at Stanford have created an integrated computational model of a cell. Their work was featured in a recent issue of Cell magazine and a New York Times article and could lead to big things. The side news is that the artwork Dr. Covert enlisted us to create was accepted by Cell magazine and featured on the cover. You can see a larger version of the winning cover by clicking on the thumbnail image above. It’s a composite image of chalkboard diagrams and formulas relevant to what went into creating the cell model (artist: Dr. Markus Covert). 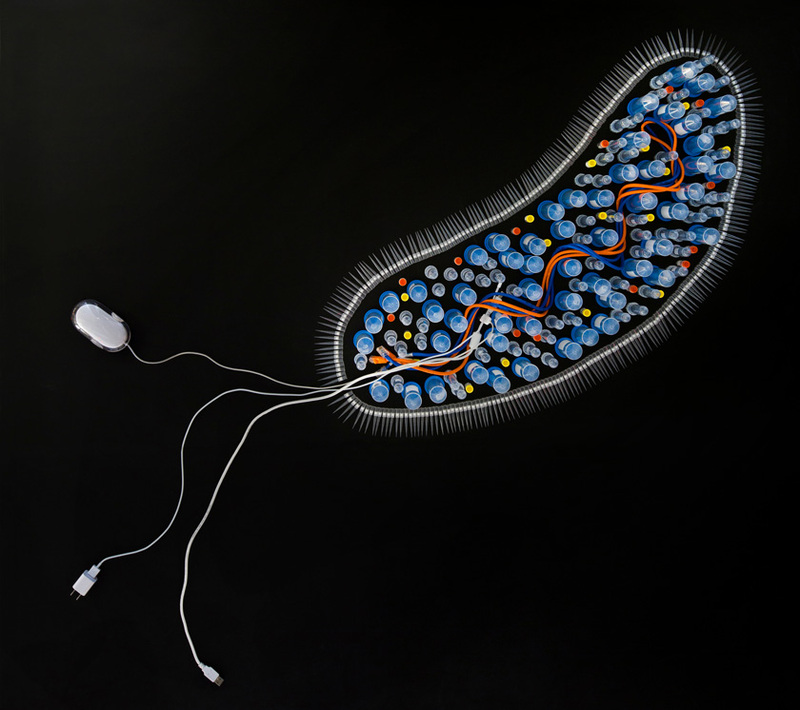 One of our favorite images that didn’t make the cut was a pseudo cell we created from a mixture of traditional lab supplies and computing accessories. Many thanks to Bernard André for the excellent photography work. I worked with MediaX at Stanford University to illustrate the process for clearing copyrighted materials developed by the Stanford Intellectual Property Exchange (SIPX). Their system removes obstacles to the proper licensing of content in a similar way that iTunes made it easier for us to download music legally. The poster we created together won the Best of Show and People’s Choice awards at the recent New Media Consortium conference held in Boston at MIT. I have always been leery of design awards, but it is nice to receive some recognition now and then, especially if it gives my clients some helpful publicity. You can read a full article explaining the effort, along with a video showing some of the good people I worked with, on the New Media Consortium website. This week, my sister tipped me off about The Atavist, a new take on multi-layered storytelling via iPhone or iPad apps (also available on Kindle and Nook). Threestory Studio got its name in part because of my interest in telling stories visually, so I was intrigued to see what The Atavist had to offer. One of the first things I discovered was a rich infographic showing the events leading up to the fall of the regime in Egypt. 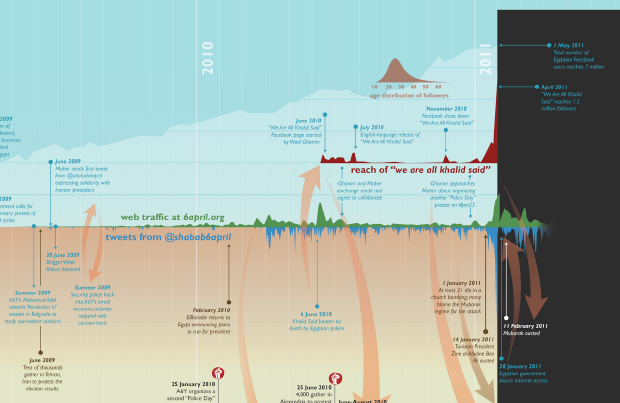 It combines a timeline of events with web traffic data and social media engagement in Egypt. It wasn’t immediately clear what the black bars rising from the bottom were – they appear to indicate numbers of people involved in protests or revolutionary activities. Otherwise, this graphic receives high marks. The full graphic can be downloaded here. It was created by Erik Steiner of the Spatial History Project at Stanford University. I recently taught an information design workshop to science graduate students at Stanford University. The idea was to give scientists some grounding in design principles and processes that could help them in presenting their work. They were hungry for examples and I found Juan Velasco’s National Infographic blog extremely useful. 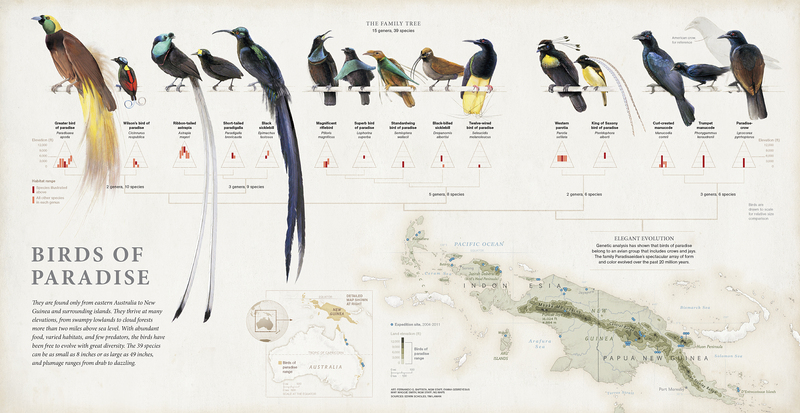 Especially his post about the design decisions that went into creating a graphic for a National Geographic article on Birds of Paradise. This blog is focused on information design, the creation of infographics for visual understanding of complex processes, data and ideas. © 2019 Threestory Studio. All Rights Reserved.